My Kurt Kinetic Rock and Roll Trainer Review: During the off season, when it’s too cold to ride outdoors, many addicted cyclists migrate to indoor bicycle training. I am personally one of those cyclists who is addicted to riding. I can’t stop riding through the winter months and just start up again next spring (let alone go a few days without being on a bike). Along with an addicted cyclist, comes the need to splurge on a good indoor bicycle trainer. I opted to purchase the Kinetic Rock and Roll Trainer by Kurt. 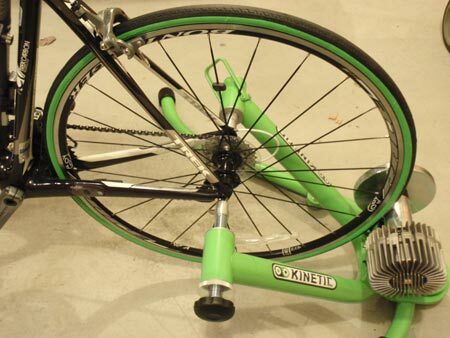 The Kurt line of bike trainers are recognized by their bright green color. Moreover, they tend to stand out in a crowd. Similar to its little brother the Road Machine, this indoor bike trainer utilizes a large roller magnetically coupled to a sealed synthetic fluid filled chamber. This fluid resistance chamber design is 100% guaranteed by Kurt to be leak free for life. Rubber bushing are perhaps the most unique feature of the Rock and Roll trainer, allowing the bike to sway or rock from side to side while riding. Built like a tank, the Kinetic by Kurt Rock and Roll Trainer weighs in at 32lbs. Simple and concise instructions made assembly a breeze. 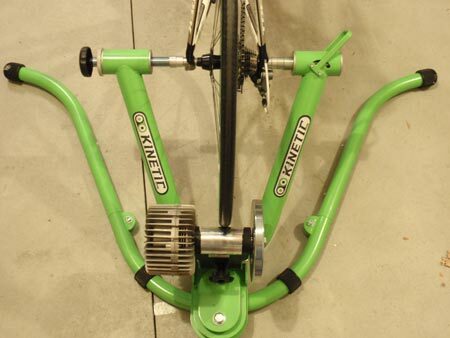 The Kinetic uses a quick release lever making it easy to remove a Mounted bicycle from the trainer. Spinning up on the fluid roller is relatively quiet. At riding speeds the Kurt Kinetic Rock and Roll Trainer is super smooth. Being a fluid trainer, it seems to duplicate the feel of a real road ride very well. I would go as far to say the Rock and Roll creates the most realistic road like cycling experience I have experienced, while riding stationary. Especially when compared to a wind or magnetic trainer. The faster you spin, the more resistance you encounter.